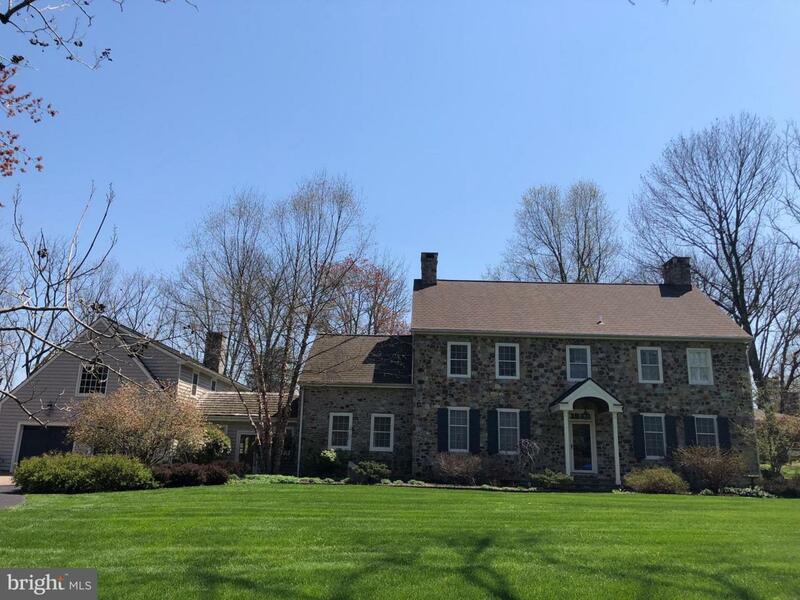 A beautiful Bucks County farmhouse tucked away on a spacious wooded lot. This fine home has high ceilings and hardwood floors throughout, four functioning wood burning fireplaces, and excellent trim including crown molding and chair rail. The large, open spaced, kitchen has very long countertops and a towering stone fronted fireplace. Full bath and bedroom on the first floor, with master suite and two additional bedrooms upstairs. The master suite has an updated and tastefully redone bathroom, complete with glass shower and a spacious relaxing tub. Private exercise room on second floor. Newer mechanicals, septic, roof and driveway. Newly refurbished pool area featuring a poolhouse complete with gas grill, fireplace, refrigerators, and a custom sound system. The attached two car garage boasts an upstairs, one bedroom nanny suite with full bath, eat-in kitchen, and fireplace. Don't miss the opportunity to see this lovely home today.